If you are looking for a little ambience when your are pigging out on Kerala style cuisine and seafood, while you are in Cochin, try some of the places we have listed. Avenue Regent, MG road. tel # 0484-372660, 372661: A pathira thattu, or to translate roughly, a midnight roadside stall. Food available from 2000 hours 0100 hours. Rs 150, all inclusive. Liquor available. Ceylon Bake House, in a narrow lane off M G road, next to Kera Bhavan, tel # 0484-367081: A bewilderingly mixed menu, but the Keralite specialities are good. Reasonable prices. No liquor. Copper Chimney, in the Ravipuram area on M G road, tel # 0484-368232: No relation to its famous namesake in Bombay or elsewhere. Authentic ethnic food. Pungent and tasty, except for the excess oil. Very down to earth prices. No liquor. Dwarka, MG road, opposite the Kottakal Ayurveda Pharma, tel # 0484-352916: One of the oldest places in Ernakulam for wholesome vegetarian Indian food. Hearty north Indian fare ensures a faithful clientele. Mid range pricing. Liquor not served. You cannot miss this towering structure on MG road. Fry's Village Restaurant, at the far end of Chittoor road, next to Mymoon theatre, tel # 0484-353983: Located in an old fashioned tharavad or family home. An interesting menu that offers ethnic specialities. Prices: middle of the road. No liquor. The Fort House, Calvathi road, Fort Cochin, tel # 0484-226103, 225785: Only two years old, family run, and well-known for its food. Mainly 'Latin Christian' fare. Cooked to order so ring up if planning a visit. Prices: mid range. No liquor. Indian Coffee House, Ernakulam: There are two branches of this traditional Kerala fast food eatery located in Ernakulum. One is on Cannon Shed Road near the Main Jetty. The other is at Jos Junction on Durbar Hall Road. Typical south Indian snacks. No liquor served. Rahamthulla Hotel, New road, in the Muslim quarter of Mattancherry at the junction, tel # 0484-226080: A small dingy place in a bylane but justly famous for its biriyani. Prices: extremely reasonable. No liquor. Rice Boats, Taj Malabar Hotel, at the far end of Willingdon Island, near the Port Trust headquarters, tel # 0484-666811, 668010: The fish curries are not a patch on what you might have eaten in a Kerala home. But it is still good seafood. Request for spicy, Kerala fare. Authentic ethnic fish dishes as well as some great continental seafood available. The ambience of Malabar is lovely. The restaurants consists of long rice boats/canoes or valloms and one dines inside the boats. Expensive.Liquor served. Seagull, Calvathi road, Fort Cochin, tel # 0484-228128: Old place that could do with some renovation. The view, however, is terrific and the Indian food has been adapted for foreign palates. Price: mid range. Liquor served. Sulabh, DH road, off M G road, tel # 0484-353501, 361415: Pure vegetarian. This is Bharat Tourist Home's south Indian restaurant. Though the general fare is Udipi-style, check out the Kerala breakfast and the lunch time thali. Price: reasonable. No liquor. The Travancore Restaurant, at the beginning of the road leading to Marine Drive, close to the KTDC office, tel # 0484-351026: Separate menus for breakfast, lunch and dinner, along with a vegetarian lunch thali that's good value for money. Popularly known as Four Foods. Very reasonable prices. No liquor. Woodlands, at a major junction on M G road, tel # 0484-368900: Totally vegetarian and like Woodlands elsewhere in India, well known for its fluffy idlis and crisp dosas. Prices: little high. No liquor. Pandhal, M G road, tel # 0484-367759, 380561: Marketed as a family restaurant, this restaurant is also owned by Casino Group. There also have an attached pastry counter. Expensive. Liquor served. Renaissance, M G road, tel # 0484-372660, 372661: This is Avenue Regent's multicuisine restaurant. They offer quite a bit of continental food and also have Chinese and Thai food apart from Indian dishes. Lunch is buffet style, dinner a la carte. Liquor served. Expensive. Tharavad, on Willingdon Island, close to the old railway station of Cochin Habour Terminus, tel # 0484-668221, 666821: This is Casino hotel's coffee shop. A variety of cuisines are available throughout the day. Expensive. The buffet lunch is not too expensive. Liquor served. Utsav, Taj Residency, at the beginning of Marine Drive, opposite the KTDC office, tel # 0484-371471: A wide range of food available; mainly Indian cusisine. Expensive. More economical lunch buffet also available. Liquor available. Waterfront Cafe, Taj Malabar Hotel, at the far end of Willingdon Island, near the Port Trust headquarters, tel # 0484-666811, 666010: The location of the restaurant is reason to visit it. 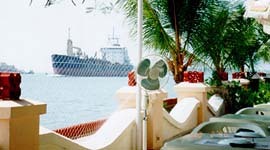 Situated on a lagoon facing the sea, across the way is Mattancherry and on the other side is a channel through which large ships use to reach Cochin Harbour. The large tankers and vessels pass close enough to the restaurant to give the impression that they are practically careening into the cafe. Mixed cusine and quick bites are available. Continental food available, but the accent is on ethnic dishes. Lip smacking fare. Expensive. Liquor served. Great spot to while away a few hours over coffee. Fairly reasonable buffet lunches. Chinese Garden, Warriom road, the lane opposite Kottakal Arya Vaidya Sala, tel # 363710: An old haunt that locals continue to frequent though standards have slipped a bit in recent years. Prices: high. Liquor served. Jade Pavilion, Taj Malabar Hotel, at the far end of Willingdon Island, near the Port Trust headquarters, tel # 0484-666811, 668010: Authentic Chinese. Good seafood. Expensive. Liquor available. Meenachil, off Manorama junction, in the residential area of Panampilly Nagar, tel # 0484-315709: A fairly new place. Very basic decor. Excellent reasonably priced food. Liquor not served. The Bubble Café, at the beginning of Marine Drive, opposite the KTDC office, tel # 0484-371471: Taj Residency's new international eatery. Fusion cuisine. French, Italian, Mexican cooking with a touch of ethnic flavour, resulting in some marvellous 'marriage'. Interesting decor. The best of wines available. The Malabar House Residency, Parade road, Fort Kochi, tel # 0484-221199: Fairly new. A small restaurant with excellent continental cuisine. Prices on the higher side. Liquor served. Kashi, Burgher Street, Fort Kochi: No frills, simple café, Kashi is run by an enterprising couple. Hearty, filling food. Good value for money. A favourite with foreign tourists. No liquor served. Best Bakers, outlets at Kacheripady, Vytilla Junction, Kadavanthara, Thevara, tel # 0484-395709: Great patties, cutlets and bread loaves. Bimbi's, on Marine Drive, opposite the GCDA complex, tel # 0484-355191 and another branch in a lane off M G road, : Western and Indian fast food. Hot favourites are Indian items like bhel, chaat and pau bhaji. Favoured stopover for youngsters. Cookie shop, Chandrika building, ground floor, M G road, tel # 0484-368255: Trendy and upmarket. Rolls, burgers, pizzas, pastries and the like available. Expensive. La Pizzeria, GCDA shopping complex, Marine Drive, tel # 0484-371331: Only pizzas. Newly established but already a hangout for Western tourists. Prices are reasonable. Home delivery available. The Oven, Marine Drive, near Shridhar theatre, tel # 0484-360578: Western fast food and wide range of sweets and pastries available. Some good milkshakes. Extremely popular with families. Regal Bakery, Thevara junction, tel # 0484-311823: Excellent pastries. Very good birthday cakes at reasonable prices. Swastik Sweets, Pallimukku, M G road, tel # 0484-374149: Every type of north Indian sweet and savoury available here. Fabulous stuff even if the prices are on the higher side. Great place for those with a sweet tooth. Sweet House, M G road, not far from Cookie Shop, tel # 0484-366855: A good stopover for banana chips. You can get them fresh and warm if you ask for it. The Flavours of Coconut Land: Restaurant Hopping in Cochin.